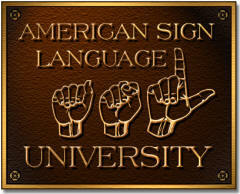 ASLU is an online American Sign Language curriculum resource center. ASLU provides many free self-study materials, lessons, and information, as well as fee-based instructor-guided courses. Many instructors use the ASLU lessons as a free "textbook" for their local ASL classes. ASLU has been offering online sign language instruction since 1997. The program began as an effort to support parents of Deaf children living in rural or "outlying" areas without access to sign language classes. Many students requested the opportunity to use these courses to fulfill language requirements at their local high school or college. This required documentation of course participation and verification of the student's signing ability. Since verification and documentation is a time consuming process requiring the attention and participation of a skilled ASL instructor, a formal fee-based program was made available separate from and in addition to the free resources. Individuals who do not need documentation or instructor-based evaluation should not register nor pay tuition. Such individuals are welcome to self-study from the various publicly available Lifeprint.com lessons for free. ASLU was founded by Dr. William G. Vicars, Ed.D. (Also widely known as "Dr. Bill"), who is currently the program director, lead instructor, and webmaster. He holds an accredited doctorate in Deaf Studies / Deaf Education from Lamar University in Texas and is currently a full-time Associate Professor of American Sign Language and Deaf Studies at California State University - Sacramento. Since ASLU is mainly a curriculum resource center we are not seeking accreditation. We do not claim to prepare individuals for employment nor do we offer a degree. While we do provide documentation for those students who register and pay tuition for ASL 1 or ASL 2, it is the student's local college or school that provides credit to the student. ASLU documentation helps the student demonstrate to local school that he or she has completed a course of study generally equivalent to that of a college or high school ASL program. This documentation indicates the amount and quality of work completed by registered tuition-paying students on transcript in the form of Continuing Education Units (CEUs). One Continuing Education Unit (CEU) is equal to ten contact hours of participation in an organized continuing education experience under responsible sponsorship, capable direction and qualified instruction. ASLU does not award college credit. The student's local college or high school may award credit for participation in this program. Prior to registering and paying tuition at ASLU students should check with their local college or high school to determine if the local institution will accept the student's work in this program for credit. The ASLU transcript provides letter grades based on test scores and completed assignments. Courses (ASL 1 and or ASL 2) are open enrollment, open completion. Each course requires approximately 75 hours to complete. Each course is designed to fit into a traditional 15-week semester-length study program but can be completed either faster or slower depending on each student's needs, abilities, and time availability. Assignments and examinations may be turned in early without penalty. Students may work as fast or slow as they would like to meet their local schedules. ASLU allows a maximum of one year to complete a course. High Schools and Colleges collaborating with ASLU may require specific schedules and due dates. No in-person attendance is involved, but students are expected to complete a minimum of one lesson per week to be considered progressing. Upon three weeks of inactivity, students may be dropped from program. Eligibility: To participate in the documentation program, students must be eighteen years of age or older or have permission from their parent or guardian. Students are required to read all assignments and complete required assignments and/or exams. In addition, they must be free from harmful drugs or alcohol while participating in any course-related activities. The curriculum for this program is online at www.lifeprint.com. See the "lessons" section. Transcripts: Letter grades will be awarded based on test scores and completed assignments. Full documentation of participation and progress will be provided upon completion of the program. Lifeprint will maintain transcripts of student work for a minimum of 360 days after completion of program. The first transcript is provided free. After which it is $10 for one transcript plus $1 for each additional copy in the same request. Notice: ASL University is not claiming to prepare anyone for certification or employment. To receive credit from an accredited institution you must contact that institution's registration department and make arrangements. Get it in writing. While this program is intended to fulfill college or high school foreign language entrance and exit requirements -- additional training beyond the scope of this program would be required to prepare you to be a certified sign language interpreter. Prior to interpreting for pay in most states, individuals must first become certified by passing a rigorous examination administered by a state or national organization. Certifying organizations generally charge for such examinations and there is no guarantee that you will pass. Cost per course is $483. "ASL 1" at ASLU is equivalent to "High School Year 1" Language." "ASL 2" at ASLU is equivalent to "High School Year 2 Language." For more information see "the catalog." Students are entitled to a full refund during the first 3 days after enrollment after which there is no refund as long as ASLU provides the student access to an appropriate curriculum which may be online, reasonable access to a qualified ASL instructor for course related questions and guidance for up to a year, reasonable access to the ASL University website or equivalent, and a qualified instructor-based evaluation of the student's expressive video and receptive final exam. ABOVE: Dr. Bill Vicars in his day job at CSU Sacramento. Note: CSUS is not affiliated with this website, it is just one of the places where Dr. Bill teaches. Welcome to ASLU! I'm Dr. Bill. 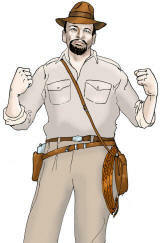 (Also known in some circles as "Safari Bill"). When not out having adventures I disguise myself as a mild mannered college professor at Sacramento State University (in California, USA). I occasionally get email from people seeking to fulfill high school or college language requirements who want to take a graded course and receive documentation. If that's what you are looking for you can click here for information about how to register for an instructor-graded online course that provides documentation on a transcript. If you are a teacher, parent, or autodidact (Ha! look it up) check out the links below. ASLU is a curriculum resource center. We do not offer a degree. We do not claim to prepare individuals for employment. Nor are not seeking accreditation. Mostly we just offer an excellent (and continually evolving) free self-study ASL curriculum that teachers throughout the world can use to teach their ASL classes. Many people like to dive in and start learning with "Lesson 1," or check out the "First 100 Signs" mini-tour or the Lifeprint Library. American Sign Language is a complete, natural language. In addition to learning vocabulary, becoming truly fluent at ASL involves learning grammar, culture, and history. "For registered (tuition paying) students, do you send the local school district a letter or certificate that states the number of hours completed so that the district can convert those hours into credits?" Do you have a way to account for [the student's] time or do you just estimate that they have done a certain number of hours? We require the student to complete a quiz at the end of each of the 15 lessons. This is the same course curriculum I use for my ASL courses at California State University that carry 3 units. The course easily qualifies for 4 units--for example Belinda Vicars has taught this curriculum at Sierra College (Rocklin, California, 2008 - 2010) for 4 units. A 4-semester unit college course typically involves 4 hours per week of contact seat-time for 15 weeks and is understood to involve approximately 1 to 2 hours of homework/practice time for each hour of class. Thus a student who successfully completes the quizzes and final exam has demonstrated a level of proficiency that would have taken 60 classroom contact hours. It is common for school district administrators to accept a 1-semester college course as the equivalent of a 1-year ASL course. In terms of actual contact hours the high school course would typically consist of 90 sessions of 50 minutes vs a college semester consisting of 60 sessions of 50 minutes (or more likely 30 sessions of 100 minutes). The difference in seat time (90 seat-time hours for a high school course vs 60 seat-time hours for a college course) is also typical because college students are expected to invest more time doing homework outside of class. What is important though is what your local school district or program believes about credits. My job is to present the student with an opportunity to participate an organized continuing education experience under responsible sponsorship, capable direction, and qualified instruction. Upon successful completion of the course, I or one of my faculty provide documentation indicating that the student has completed a course equivalent to that of a typical college ASL course of the specified level. What do we get for documentation? You get a "Continuing Education Units" form. See: "transcript"
Could you tell me how you think a 10 or 11th grader would do taking this class online? Most 10th or 11th graders do very well taking ASL online. Like a duck to water sort of thing. Based on those who have enrolled how many have completed the program and earned credit? Answer: Remember, we don't provide credit. We provide Continuing Education Units only. But we've had over a hundred students receive credit from their local schools. The vast majority who have enrolled have completed the program and received continuing education units. When used in college settings, of a class of 15 typically 14 will pass. Note: One or two out of the 30 tend to fail either the receptive final or the expressive final and need to retake the exam. We have set up the course so that the student can re-take the final exam as many times as needed until they pass the course. This works out well since it allows us to "fail" a student when their performance is not up to standards, and yet they are able to redouble their efforts and upon raising their skills they are able to pass the course. Note: Retakes cost $20. We charge the fee to cover the extra time required to grade the retake, but more importantly we do it to encourage serious efforts at passing on exam. Who do you consider to be a good candidate to be an online learner of sign language? Someone who likes spending time in front of a computer. Someone who is able to set up and manage their own "Myspace" or "Facebook" (or similar) account. Someone who feels comfortable reading and following information from a computer screen. Additionally I think that "online learning" is particularly helpful for those students who might prefer to work at either a slower or faster pace than their peers. A computer doesn't get tired of repeating itself. A computer doesn't judge you. You click a button and it shows you again without rolling its eyes or taking a deep breath. This kind of patience (the patience of a machine) can give certain students the confidence to keep trying until they "get it." Some people feel that sign language is more 3 dimensional and the internet would be too two dimensional. Reply: Indeed, ASL is 3-dimensional. An in-person ASL course is potentially much more effective at teaching ASL than an online course. That being said, it is important to realize that a lot depends on the circumstances of the course: The qualifications of the instructor, the number of students competing for the instructor's attention, the patience of the instructor, the quality of the lessons, the user friendliness of the curriculum, etc. It is quite possible that some students will actually do much better studying online than they would in an in-person course. Online courses allow for asynchronous learning and progress. Students can study nearly any time and nearly anyplace. They can study from the screen of their phone (320 x 240 resolution or higher flash video capable). Why does Lifeprint have a such a strict 3-day 100% refund policy after which there is no refund? Sometimes people need insurance that they will be able to fill a language requirement for graduation. So they sign up for this program and breathe a sigh of relief knowing that they are covered and have access to a flexible, online course that is able to fill their language requirement. Lifeprint then maintains its curriculum, pays the utilities, pays for web hosting, and renews its domain registration service, etc. -- all in order to stay in business. Then later the distance education student decides he or she doesn't need the class, doesn't want to put forth the effort, or can't find the time to do it. But Lifeprint still had to "stay in business" during that time in order to "be around" and provide that "insurance" to the distance education student. 1. We stay available to receive assignments. 2. We keep the website active so the student can study. 3. We make payments to the web host for server storage space. 4. We pay monthly for my DSL connection so we can maintain the site. 5. We keep my email account active and maintained (which takes hours!) so we can receive student emails. 6. We make payments on ASLU's physical office location. 7. We pay money to upgrade and keep the office computers working. 8. We pay money to the domain name registration service to keep the website name registered. 9. We pay the electric bill each month so we can operate the equipment. These and the many other costs all add up. Since we are stuck with these expenses whether or not the student decides to study and complete the class--we have to handle the finances very similar to the way "health clubs" and "gyms" handle their membership fees. They charge their fees up front and provide a brief reconsideration period after which there is no refund. That way people don't come back later and say, "I never exercised and I want my money back." Otherwise the health club would go out of business. On the bright side, please know that your registration fees do indeed go toward keeping Lifeprint up and running and many tens of thousands of people all over the world use the ASL dictionary and lessons to learn how to communicate with their Deaf friends, coworkers, and children. Question: How long does it take to complete the course? Answer: About 60 hours plus review and practice time. The length of time it takes to complete the course depends on several factors. * How much available time does the student have to work on the course? * How much of a self-starter is the student? * How long is the student able to focus for? * How good at "language acquisition" is the student? * How much review will the student need to recall previous lessons? * Is the student kinesthetically talented? * How much "prior exposure" to ASL does the student have? If the student did "one lesson per day" and then took 3 days to do a research paper, 2 days to complete a video, and another day to do the final exam, then I reckon he/she could complete the course in about 3 weeks -- that's assuming around 3 hours per day of effort and working on it everyday. A more realistic schedule would be 15 weeks -- and that is if the student is focusing on vocabulary and grammar acquisition. If the student reads all of the various cultural information and links - that could take several extra months -- which is why a "college" semester class is considered equivalent to a "one year" high school class. It takes work to pass, but it is not difficult -- if you set up an actual schedule, dig in, invest 45 to 60 hours online and another 20 or so doing the quizzes, research paper, expressive video, and receptive final. The difficulty is not in the material, but in the self-discipline to schedule your time accordingly. So far I've only failed a few students (out of well over 100) due to "lack of ability." Let me tell you about a typical case. It was a woman in her late 40's. Her mistake was in going through the quizzes as mere assignments to be completed instead of as tools to prepare for the final. She would visit the lesson pages long enough to identify the signs on the quiz, type them, submit them, and then move on. She did not practice the sentences enough. The signs were simply going into her short term memory and being forgotten the next day. At the end of the semester she had earned credit for the lesson quizzes but she did not know the signs and grammar she covered in the lessons well enough to recognize them on the comprehensive final (receptive) in sentence form, and thus could not pass the final exam with a C or better (which I require of my students to pass my class). But if a person will set a goal to learn the material, including the facial expressions and grammar they will be able to complete the receptive final and expressive video and will pass the course. Would you believe quite a few of my students (online) are Special Education (developmentally disabled) students? But they tend to complete the course with flying colors because their local aide sets up a schedule for them and schedules time for them sit down and get to it. If they can do it--I'm sure you can do it.